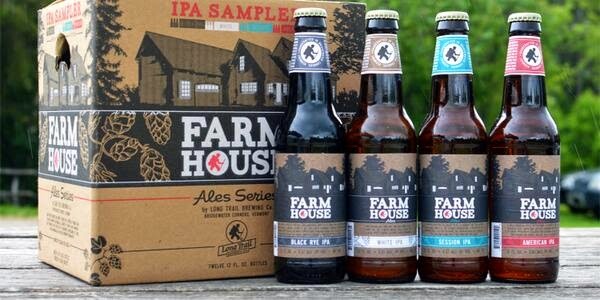 Long Trail Brewing from Bridgewater Corners, Vermont, has released there latest Farmhouse Variety 12pack. This IPA variety pack includes 4 different IPA's including a Black Rye IPA, Session IPA, White IPA and American IPA. The Black Rye IPA weighs in at 6.3% and 48 IBU's, The American IPA which has been previously released on draft only is 6.4%ABV and 70 IBU's. The White IPA is said to be part IPA and part Belgian Wit and is 6.2%ABV and 45 IBU's. And last but not least the Session IPA is lower ABV at 4.5% and the IBUs on this brew is at 50 which should have a nice bitterness and hop aroma. Look for this Variety pack in better beer retailers across Long Island.